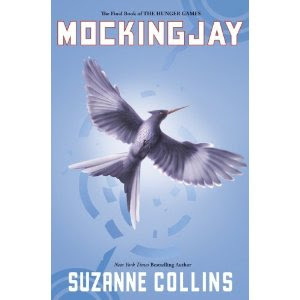 Google+ Reading Teen: MOCKINGJAY Contest!! Let the games begin! MOCKINGJAY Contest!! Let the games begin! "I stare down at my shoes, watching as a fine layer of ash settles on the worn leather." - You must be finished with the book in the 24 hour period! August 24 - 24 hours to read MockingJay! *You can read the book with us and share all comments you wish, but you must be a follower to win the prize pack! I'm Team Gale, have always been! I feel like Peeta is a Bella male version: requires saving all the time! Gale is awesome! I hope Suzanne Collins give Gale more opportunities with Katniss in Mockingjay. I am so in! this might be the coolest contest ever! free stuff for reading one of the most highly anticipated books of the year (dare I say, the decade?)! simply awesome. count me in. I'm getting my copy at midnight! and will be reading it at 12:01. It's 12:30am and I've got my copy started! "each is plainly marked with a number. 3901,3902,3903..."
"Well don't expect us to be too impressed. We just saw Finnick Odair in his underwear." @Silverpheonix Well, looks like it just you and us (the RaedingTeen crew)! I (Amy) am on pg. 21, it's a little chaotic right now. I need to know if Peeta is O.K.???? Don't tell me that wasn't a question... Haha Just anxious!!! I'm not crazy about this District 13! Starting chapter five. I'm a little sleepy. I need to eat some grain or bread for strength, I guess. I might take a power nap soon. Where are all my readers??? "In other words, I step out of line and were all dead." I'm not going to lie...I paused my reading because things aren't playing out how I want them too. "They'll either want to kill you, kiss you or to be you." Then there's the sound of his boot on someone's face. This is the one rule I think I Will make an effort to abide. -PG 52. I have to go back to work but I shall return in 3 hrs. "But for all that, at the end of the day, they were still slaves." "You should have been the Mockingjay. No one would have had to feed you lines"
PAGE 177!!!!! There are NO words... speechless. I'm having to take a breather>>> PANIC has now set in and I need to think about feeding my kids. Hmmm I wonder if I whip up some Grayfish and Okra soup they'll eat it? His voice is quiet, but mine rings through the room. "Let the Seventy-sixth Hunger Games begin!" "next time we see each other, we'll be free of him." "I'm the only one losing stew because I'm the only one reacting to the odor. Drifting up from the sewage. Roses. I begin to tremble." "It's as if Snow's breathing right in my face, telling me it's time to die." Suzanne Collins is really giving me nerves a roller coaster ride. Up & Down and plenty of loops so hold on. "Apart from some obviously bleached curls, he looks about as much like Peeta as I do." "want me to lie about it?" "no, I want you to rethink it & come up with the right opinion." I loved every word. Every sentence. The end was perfect. I laughed, cried, got angry, everything in one reading. What a perfect end to a great trilogy. "...Only it was real. And it didn't stop after an hour. Tick, tock." "Tick, tock," I whisper back. "Colsing my eyes doesn't help. Fire burns brighter in the darkness." "Whatever it takes to break you." Wow. "We're fickle, stupid beings with poor memories and a great gift for self-destruction." I can't believe it's over. there aren't going to be any more. The ending is as good as I hoped though, it completes everything. I think we all need to bow and kiss the feet of the wonder that is Suzanne Collins. OMG! PAGE 276 ... Not for the faint of heart! "Pull it together, four-five-one." He says firmly. Any suggestions for what to do now that I'm done reading? I feel strangely empty and restless. I love how the book ended, but I'm still having trouble believing that there is no more. Anyone else feel the same? stares at the end. cries. @silver I hid your comment because Amy hasn't finished yet! :) I agree with you tho! OMG! im so sorry! i didnt even notic that i did that! "I'm so tired, Katniss." "Go to sleep," I say. He won't until I've rearranged his handcuffs and shackled him to one of the stair supports. Oh man, I forgot to keep updating throughout the day! I finished Mockingjay though and love it!!! team peeta forever come on gale fans peeta has been though sooo much omg my favorite line of mockingjay is "tied with a ribbon and taged with my name." "programmed to murder me."